If you are having a beach themed wedding you may be looking for beach wedding ideas. Whether you are getting married at the beach or just having a beach wedding theme you may want to coordinate different wedding accessories to show off your theme. But what is available in this theme? Where do you shop? Where do you come up with these ideas? Keep reading for more information. Most brides start looking for beach wedding ideas with wedding apparel - the clothes that will be worn during the wedding. When you are looking for beach wedding ideas, why not start with the dress? Choosing a wedding gown for a beach wedding or a beach wedding theme can be a lot of fun. 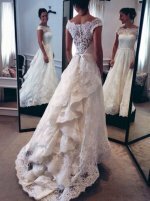 These types of dresses are usually a little bit different than the traditional wedding dresses you may be used to. For instance, they are usually made of lighter material and are slinkier, the full gowns and extra fabric is noticeably missing. There is a simple reason - comfort and functionality. 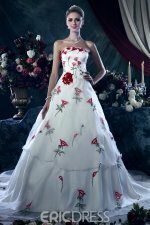 While coming up with beach wedding ideas you can also look at other apperal, outside the wedding dress. This would include the clothing for everyone else in the wedding party. Looking for more beach wedding ideas? The bridesmaid dresses can also be made of lighter material. Want to do something interesting with the groom and groomsmen? How about choosing a cummerbund with a beach wedding theme? If you are planning your day around a beach wedding theme you may want to incorporate these ideas into the rest of your look. Once you have come up with adequate beach wedding ideas for the main attire, it is time to move on to the jewelry, shoes and hair. When planning for you beach wedding theme it is of course up to you how much or how little you emphasize the theme throughout the day. If you choose to make the little things as important as the big things you might choose to show off your theme here too. For beach wedding jewelry you can choose a nice necklace or bridal set made up on keshi pearls. A bridal set as shown below would look great on the bride and you can use it for the bridesmaids as well. Brides who marry at the beach have started wearing bridal flip flops for the occasion instead of the traditional bridal shoes. You can either choose to wear simple flat flip flops or ones that are a little fancier and that come with a heel. When you have a beach wedding theme you are going to want your hair to fit in as well, but do not worry there are ways to do this as well. Now when coming up with beach wedding ideas for your bridal hairdo you really do not have to think long and hard on this one. There are many tiaras and hair clips available that look like flowers or beach items such as starfish. Adding one little item to your hairdo can make all the difference. Now that we have come up with ways to make the wedding party look like they fit in with the beach wedding theme, what do we do about the rest of the wedding? Here are some ideas. 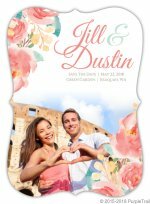 If you are planning on having a long engagement before the wedding you might want to start by choosing a nice save the date magnet. By choosing a beach wedding theme magnet you can let your guests know right away what to expect. Whether you choose to use a save the date magnet or not, you can still choose to incorporate beach wedding invitations into your beach wedding ideas. 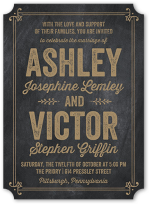 These invitations will work the same way that the magnets did, they fit into your theme, they let your guests know what to expect and they make a nice keepsake for everyone. When choosing decorations, a simple centerpiece you can use is decorated candles. You can either use them as centerpieces at all the tables or you can use them at certain spots like the cake table, the entranceway or near appetizers. You can also incorporate your beach wedding theme into your cake topper. In fact there are many places in your ceremony and reception that you can come up with beach wedding ideas to utilize. Because beach weddings have gained in popularity so much, there are many different types of beach cake toppers to choose from. You can use ones which are obviously a bride and groom on the beach or you can use cake toppers depicting palm trees or starfish. Below you will see a glass cake topper with starfish on it; a flower has been placed artistically behind it to add color to the cake and topper. Finally the wedding favors. There are so many different designs and types of wedding favors that you can use. You can use ones that show flip flops, sandcastles, sailboats, beach chairs, starfish, seashells and more. These favors could be coasters, mini notebooks, candles, wine stoppers, mint tins or other edible goodies. When choosing your favors be creative and decide what you want to give and what you want to portray. As you can see there are so many beach wedding ideas to choose from when planning your wedding. It is not that difficult to come up with fabulous ideas for your beach wedding theme!